Never let it be said that Jeep didn’t know and take care of its customer base. Ever since the end of World War II, Jeep has carved out a nice market niche offering reliable go anywhere 4×4 vehicles. Before the popularity of the SUV, Jeep was the only game in town for serious off-road aficionados. Not known by many, Jeep also was the first to offer a luxurious and sporty 4×4 many years ago. From 1966-1969, Jeep offered the Super Wagoneer – a plush Wagoneer on steroids. The Super Wagoneer, had almost as many available luxury options as a Cadillac of the same vintage. There was even a beautifully sculpted center console where the automatic transmission shifter resided (there are still SUVs today such as the Cadillac Escalade that don’t have a center console shifter). The 1966 Jeep Super Wagoneer had a high performance 270 horsepower AMC 327 CID V8. To put this into perspective the highest performance 1966 Mustang was powered by a 271 horsepower K-code Hi-Po 289 V8. From 1968 to 1969 Jeep replaced the AMC 327 in the Super Wagoneer with a new high-performance 350 CID V8 taken right out the Buick Skylark. To say the Super Wagoneer was way ahead of its time would be an understatement. Not only was the Super Wagoneer luxurious and performance oriented it also had the off-road prowess expected of a Jeep. Unfortunately the buying public at the time was not ready for a vehicle like the Super Wagoneer. It would be almost 30 years before the buying public was ready. After the Super Wagoneer, the Wagoneer and later the Grand Wagoneer continued on as Jeep’s flagship vehicle. By the 1980s it had become loaded with power and luxury options, making it a common site at country clubs, operas, and every other function of the upper crust. However performance was long gone, an AMC 360 CID V8 was under the hood but with its 2-bbl carburetor and a low compression ratio, its main function was to provide good low-end torque and smooth acceleration, not burn the tires. Jeep for 1993 released an all-new unibody ZJ Grand Cherokee platform to replace the body-on-frame SJ Grand Wagoneer in the Spring of 1992. The Grand Cherokee was bigger than the smaller unibody XJ Cherokee and it used as its standard engine the XJ’s powerful 190 horsepower 4.0 liter straight 6. There was also a ZJ Grand Wagoneer for 1993 however it was essentially a V8 powered Grand Cherokee with exterior faux wood body paneling. The ZJ Grand Wagoneer was short lived and would not return for 1994. One of the reasons was the Grand Cherokee Limited, the top-of-the-line Grand Cherokee, was loaded with as many luxury options as the previous SJ Grand Wagoneer. Everything from leather seats to an automatic climate control system was standard on the Grand Cherokee Limited. Its sporty lines and monochromatic paint scheme also added to its appeal. The Grand Cherokee Limited also came standard with Jeep’s full time Quadra-Trac 4-wheel drive system, making it even more capable off road than its predecessors. 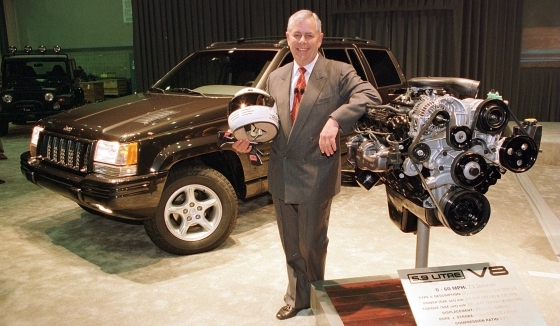 The real news for the 1993 Grand Cherokee was the mid-model year introduction of the 220 horsepower (Chrysler) 5.2 liter V8 option (Jeep fans can thank current GM Vice Chairman of Global Product Development – Robert Lutz who was the former Chrysler executive who insisted the 5.2 liter V8 be a Grand Cherokee option). At the time, this made the Grand Cherokee the only mid-sized SUV with a V8 option. As a comparison, the 1993 Ford Explorer only had a 160 horsepower 4.0 liter V6. The real hidden value of the 5.2 liter V8 was not the 220 horsepower but the 285 lb-ft of torque which made the Grand Cherokee feel more like a 4×4 Camaro Z28. The net result was a 4,200 lbs full-time 4-wheel drive Grand Cherokee that ran 0-60 mph in around 8 seconds and the 1/4 mile in about 16 seconds. Now granted the ultra fast GMC turbo Typhoon from this period was faster, but it was as comfortable off-road as a Corvette and with its small cargo capacity and 2-doors it was useless as a utility vehicle. The ZJ Grand Cherokee sold very well, it was by far Jeep’s hottest seller. The 5.2 liter V8 powered Grand Cherokee Limited was indeed the modern version of the Super Wagoneer. Jeep decided to step things up another notch for 1998 by offering the ultra high performance full-time 4-wheel drive Grand Cherokee 5.9 Limited. The Grand Cherokee 5.9 Limited had standard the highest output V8 from Chrysler’s V8 arsenal, the 5.9 liter V8, a big gun used mostly for duty in Dodge’s full-size heavy-duty Ram Pickup. The 5.9 V8 in the Grand Cherokee produced 245 horsepower and a mighty 345 lb-ft of torque. The 5.9 had a compression ratio of 8.7:1 due to a (new for 1998) hotter camshaft. 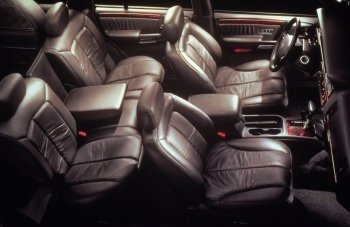 Also new for 1998 on the 5.9 was advanced timing and an electric cooling fan (a 5.9 Limited exclusive). Jeep recommended at least 91 Octane premium fuel in the 5.9 Limited. The 5.9 liter (360 CID) V8 along with the 5.2 (318 CID) V8 are members of Chrysler’s tried-and-true LA small-block V8 engine family. The LA V8 engines lasted around 40 model years in production, which was more than any other Chrysler V8. The LA V8 still lives on today (with two extra cylinder’s attached), in the form of the 505 CID (8.2 liter) V10 in the current Dodge Viper. Getting back to the 5.9 liter V8, it’s the same size in exterior dimensions as the 5.2 liter V8. In fact by looking at the two V8s side by side you can’t tell which is which until you read the block identification numbers stamped on the side of each engine block. So as you have already figured out fitting the 5.9 liter into the Grand Cherokee engine bay was a piece of cake. The difference internally between the two LA V8 brothers, is the 5.9 has a larger bore (4.0 inch) and a larger (3.58) inch stroke than the 5.2. The Grand Cherokee 5.9 Limited as tested by Motor Trend magazine (January 1998 issue), went 0-60 mph in 6.8 seconds and the 1/4 mile in 15.20 seconds. Which at the time was faster than most performance cars. And you better believe the performance oriented luxury brands were taking note, it was a just few years later that marques such as BMW, Lexus, Mercedes, etc. would have their own high performance SUVs using the Grand Cherokee 5.9 Limited’s formula. The 5.9 Limited was the fastest new SUV on the planet back in 1998, no SUV came close to matching its far superior performance. With more power on tap, Jeep gave the 5.9 Limited a Dana 44a rear axle with a standard limited slip differential and a heavy-duty 46RE 4-speed automatic transmission. These two items were not available on any other Grand Cherokee for 1998. The Dana 44a had a performance oriented axle ratio of 3.73. Stopping was an easy task with the 5.9 Limited with its large disk brakes it went 60-0 mph in a sports car like 126 ft. as recorded by Motor Trend (January 1998). The 5.9 Limited also handled well. Motor Trend magazine (January 1998) obtained a .74 on the skidpad, which was impressive for a SUV. The 5.9 Limited like the regular Grand Cherokee models had solid front and rear axles, which are ideal for off-roading but not the best for high speed driving. However Jeep did such a good job dialing in the suspension that when driving a 5.9 Limited or any ZJ Grand Cherokee it’s easy to be fooled the solid axles don’t exist due to the great ride and handling qualities for a SUV. Of course the Grand Cherokee’s unibody construction and coil spring front and rear suspension were mainly responsible for providing such great ride qualities and handling when compared to other SUVs of this era which still had harsh rear leaf springs. In comparison most SUVs of this time period felt like the yellow school bus you used to ride in during your wonder years. Visually the Grand Cherokee 5.9 Limited looked sportier than the standard Limited. There were dual air extractors on the hood that were visual and not functional along with a muscular front grille. The entire body and trim were painted in one monochromatic scheme in one of three different exterior paint colors: black (Deep Slate), white (Stone White), and silver (Bright Platinum). Also standard on the 5.9 Limited was a set of sporty five spoke 16×7" cast aluminum wheels (with Goodyear Wrangler HP P225/70R16 tires) and a 3" diameter free-flow single outlet exhaust system (similar to the setup of the smaller diameter 5.2 liter Grand Cherokee’s exhaust system). The 5.9 Limited’s exhaust also produced a louder sound than the 5.2’s exhaust. In fact it produced a deep enough muscle car V8 rumble that you could fool many into believing it was an aftermarket exhaust system. Adding to the system’s appeal was a shiny chrome exhaust tip. Inside the 5.9 Limited had wood trim populating most of the dash, along with the softest plushest leather to grace the seats of a Jeep. The 5.9 Limited only came one way – loaded with many standard power and luxury features. In other words there was power everything along with an automatic climate control system and many more goodies. The 5.9 Limited was just as good off-road as it was burning up the quarter mile. It was the complete package for a buyer who wanted a very high performance vehicle with lots of comfort, ample cargo capacity, and the ultimate off-road capabilities. In fact the Grand Cherokee’s off-road skid plate and towing hook package were available on the 5.9 Limited. And Jeep’s tough full-time 4-wheel drive Quadra-Trac system was standard on the 5.9 Limited. As with all good things they must come to an end so too the 5.9 Limited ended abruptly. 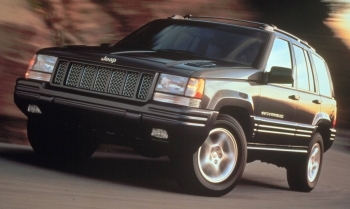 The ZJ Grand Cherokee after 1998 was gone, replaced by a new for 1999 WJ Grand Cherokee. The 5.9 liter V8 was also gone on the Grand Cherokee for 1999, and so was the 5.2 liter which had been replaced by a new 235 horsepower 4.7 liter SOHC V8. However during the middle of the WJ run a 265 horsepower 4.7 liter H.O. powered Grand Cherokee surfaced that carried on the modern Jeep performance legacy the 5.9 Limited had created. When the current WK Grand Cherokee was released in 2005 with an optional 330 horsepower 5.7 liter Hemi V8 capable of 1/4 mile times of around 15 seconds, indeed the 5.9 Limited legacy has continued. As good as this performance sounds it no longer is the best in the world for SUVs with such current players as the turbo Porsche Cayenne and supercharged Range Rover. However the story does not end there, for 2006 Jeep released the ultimate high performance SUV, in fact the fastest new factory SUV on the planet (back in 2006) – the Grand Cherokee SRT8 (6.1 liter Hemi V8). With 420 horsepower and 420 lb-ft of torque, the Grand Cherokee SRT8 hit 0-60 mph in slightly under 5.0 seconds and the 1/4 mile in around 13.3 seconds setting another performance SUV apex. In the final analysis the 5.9 Limited was a big success for Jeep. Though intended to be a low production vehicle it still managed to easily sell 14,286 units. When automobile historians look back at this SUV boom period which is coming to a close due to the looming increase in the Corporate Average Fuel Economy (C.A.F.E.) standards and current high fuel prices, they will see with clarity how the 1998 Grand Cherokee 5.9 Limited was the first of the modern muscle SUVs.